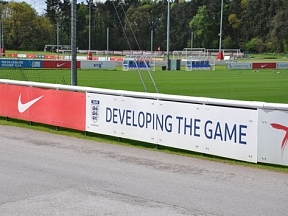 Advertising boards are available in custom sizes, we have a choice of two materials below. The most popular material is the high durability and long lasting Dibond. Dibond offers long life and durability and will withstand impact from footballs, cricket balls and so on. Dibond is a composite aluminum based material and is 3mm thick. 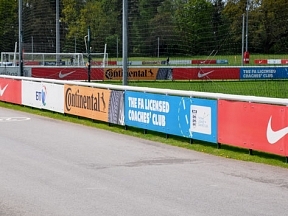 Dibond advertising boards can be used without the need of a backboard. Foamex is a plastic product with good resistance to all weathers, it is tough when mounted to a wooden backboard, however for long term use it may suffer with hard impact. If you require mounting holes, please specify in the comments box as you proceed through the checkout, we’ll need to know the hole sizes, number of holes required and spacing details. 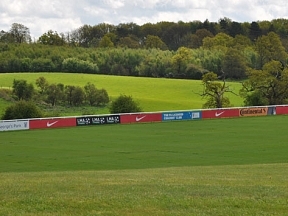 Lead time of advertising boards is 5 working days following confirmation of artwork. This may be shorter if only a small quantity is required. For a large quantity please call us on 01283 576017 to confirm lead time. 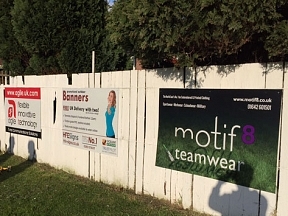 HFE Signs have supplied advertising boards to many sports clubs across the UK ranging from small village clubs upto some of the largiest clubs in the business, we are confident we can deliver the best quality available at the best prices. 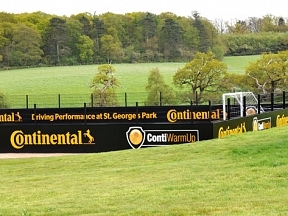 Advertising boards are generally used for sponsorship purposes, at HFE we understand that you or the sponsorer may not have the time to be creating artwork - so we are more than happy to create your artwork FREE of charge, we email you a proof for checking and print once you have approved it. Altermatively you can supply artwork or even try out exclusive Design Online tool as you proceed through checkout. Whatever you decide is easier for you, we are only a phone call away to help and support you.